When it comes to misconceptions, the many retiring overseas myths, keep several people working when they could be retired. When you retire overseas you will find it possible to live lifestyles that you could only imagine in the United States... In fact there are several countries where it is very possible to live well on nothing other than your Social Security check. No, you will not have to put money aside to pay ransoms for your loved ones...do kidnappings happen... Sure, but let's face it kidnappers would not be targeting readers of frugal retirement living... They would be camped out at the most exclusive country club in town to peruse their list of potential victims.But, if you get most of your information from the nightly news you would think that this happens every day and ransom should be planned into the family budget... it is just not so. In fact what sound bite would NBC Nightly News choose... One featuring 10 drug cartel corpses...or happy retired couple telling of their wonderful retirement lifestyle in Costa Rica. For some reason there is a misconception that people that live in other countries don't get sick or if they do they will be subjected to Third World medical care, a big and untrue retiring overseas myths... Make no mistake the healthcare system in the United States is in the top 10 in the world... No argument there... Unfortunately it is without a doubt the most expensive health care system in the world. For instance, in Mexico, after you have lived there for year you qualify for Mexican national health care...about $300 per person per year. If you are willing to pay a little more, you can purchase a top-of-the-line health insurance policy $100 a month or less in many Central American countries..., Hospitalization drugs, operations the whole 9 yards. The primary reason for such disparity in insurance cost is that the United States is one of the most litigious societies on this earth... Guess who pays for that. I was watching TV the other day about a couple that had just moved to Amsterdam... There seem to be three bicycles for every person in Holland, and accidents happen frequently. Instead of exchanging insurance information or calling a lawyer they brush themselves off and go on about their business... No system is perfect, but the cost of lawsuits is borne by everyone who pays for health insurance in the United States. We trusted our eyesight to a Venezuelan eye surgeon, for laser surgery... Two years before it was approved by the FDA in the United States. Of course, we saw lots of American doctors that were training under our Venezuelan eye surgeon who had performed over 8000 of these operations. 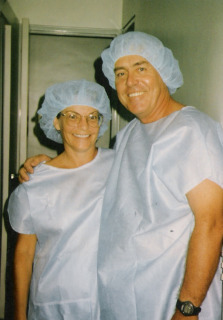 The surgery performed in 1996 has been uneventful, we are both extremely pleased with their vision have had no problems...the cost, $350 per eye...we saw a breakdown the cost and the surgeons fee was $50 per eye. Stop and think a minute, why would you never hear of the excellent healthcare you can receive overseas? Could it be the billions of dollars that the US healthcare industry, pharmaceutical companies, etc. pay each year to advertise on national TV?? Perhaps I'm cynical but that's another retiring overseas myths. Don't be shocked, but Mexico has a crime rate about one third of the United States... For instance the FBI reported murder deaths per 100,000 population in 2008... An especially violent year in Mexico, to be 40 in Baltimore 36 in Detroit and 30 in Washington DC... Mexico 10 in 100,000. In fact in one of the most popular retirement destinations for ex-pats, the Lake Chapala region of Mexico, 40 miles from Guadalajara, it is not unusual for people to leave their doors unlocked when they leave the house. Many retirees who have moved to Mexico for instance, describe the lifestyle like the United States in the 1950s... I don't see anything wrong with that... But if you get your news from the major news networks all you will hear is the latest body count among the various Mexican drug cartels. Stay away from border towns however, due to drug cartel activity. If you are worried about not having enough money to retire in the United States, you are doing yourself a disservice by not examining overseas retirement opportunities. Do not believe the many retiring overseas myths...willIf it is a choice between continuing to work in the US, or living better being retired, in Ecuador , Costa Rica, Uruguay (oooh watch out for the Nazis), Mexico...well, I think you know which choice I would make.